The Professional Regulation Commission released the official exam results of January 2015 Sanitary Engineer Examination on February 6. The Sanitary Engineer board exam results in written phase can now be viewed on this page. PRC conducted the Sanitary Engineer Licensure Examination (SELE) on January 27, 28 and 29 this year. The board of SANITARY ENGINEERING gave the series of exam subjects in three (3) consecutive days. The commission released the 24 out of 56 passed the Sanitary Engineer Licensure Examination given by the Board of Sanitary Engineering in Manila last January 2015. Last year, August, the commission released the 106 out of 166 passed the Sanitary Engineer Licensure Examination given by the Board of Sanitary Engineering in Manila. The Board of Sanitary Engineering who gave the licensure examination are Engr. Corazon De los Reyes-Romero, Chairman; Engr. Alfredo B. Espino and Engr. Florimond M. Lara, Members. The commission said that the official results were released in six (6) working days after the last day of examination. You may expect the official exam results on next month, Friday, February 6, 2015, based on the PRC's releasing date last year. 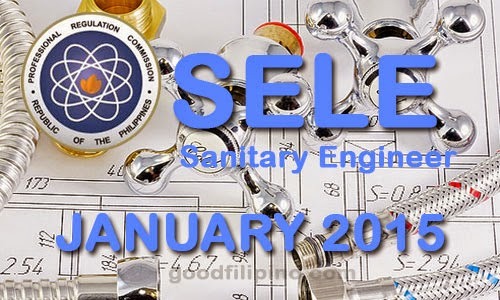 Comments or suggestions about "January 2015 Sanitary Engineer Board Exam Results - Sanitary Engineer Licensure Examination (SELE) Passers January 2015" is important to us, you may share it by using the comment box below.